Ok, I’m gonna be very honest with you here. I’m not a big sports fan. Ever since Jordan retired from the NBA, I pretty much only watch the finals of any sport. 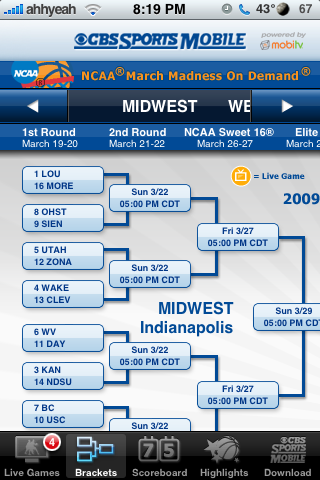 Anyway, if you are a college basketball fan this app is for you. With this app you can stream the video of every game, live from your iPhone or iPod Touch. This only works when connected to wifi but you can listen to audio if you’re on a cellular connection. Along with live video & audio, there are game recaps, bracket info, and up to the minute scores and headlines. SoccerGuide is going to be a soccer guide application featuring two soccer leagues; German league and Premier League. The application is due to be released in Cydia very soon. It comes from the developers of TourDeFrance and Formula1 Guide from firmware 1.1.x. The app will be free via Cydia and they say they might also update the application to add additional league. Below are a few preview screenshots. 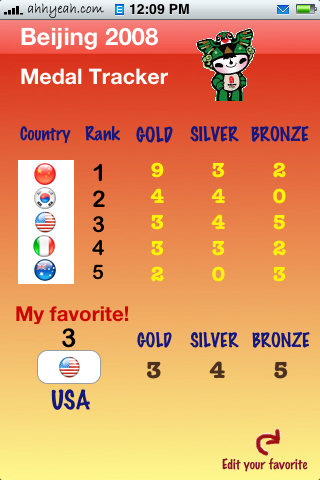 Beijing 2008 Medal Tracker is as simple as the title suggests. 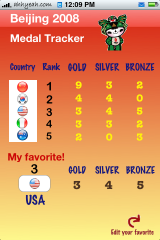 It tracks the top 5 couries in Olympic medals. You can also set your favorite team to track at the bottom. The biggest downfall of this app is the cost. 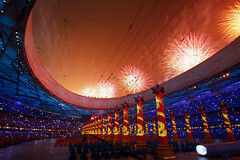 At $1.99, this app is only good for 14 days, then the Olympics are over. 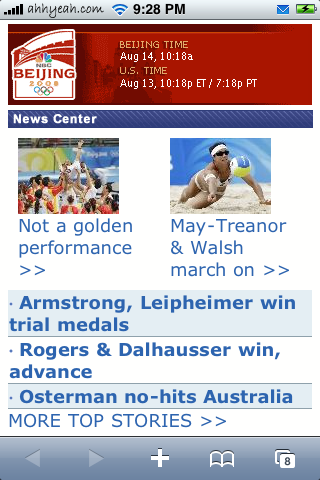 I vote pass on this one and check my earlier review of iOlympics the web app or try SportsTap from the App Store. 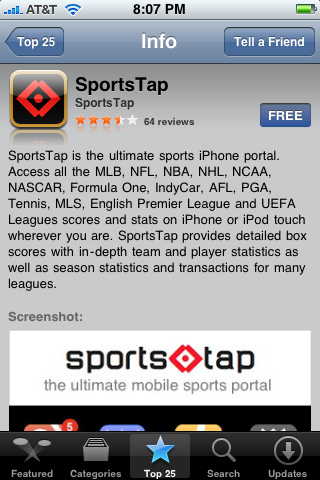 SportsTap is an application that gives you up-to-date scores and stats for multiple sports. When you open the application, you will get the main screen where you can choose from the following sports; MLB, NFL, NBA, NHL, NCAA, NASCAR, F1, IndyCar, AFL, PGA, Tennis, MLS, Premier and UEFA. There is also a lower menu bar with the options; Feedback which will open a contact form right in the application, FAQ which will open a FAQ page right in the application and Settings. In the Settings option you have the ability to turn on/off Save Last Viewed Page and Disable iPhone Sleep. If you turn on Save Last Viewed Page, then next time you open the application, it will automatically open to the last page you were on before quitting the application. I think this is a great feature and a major time saver when you are trying to quickly see if the score has changed. If you turn on the Disable iPhone Sleep option, you can leave the application open and your iPhone will not auto-lock or go into sleep mode. This will obviously drain your battery much faster but, it will leave the application open so that you can constantly check the score of a game.